When I was growing up my Mom would make roast beef with potatoes and carrots but she made hers in the oven. She used to make it often until we finally realized my Dad was allergic to beef. Up until then she always used the same dutch oven to cook it in. She would slice up an onion and put it on the top of the roast. Those roasted onions used to be my favorite part. 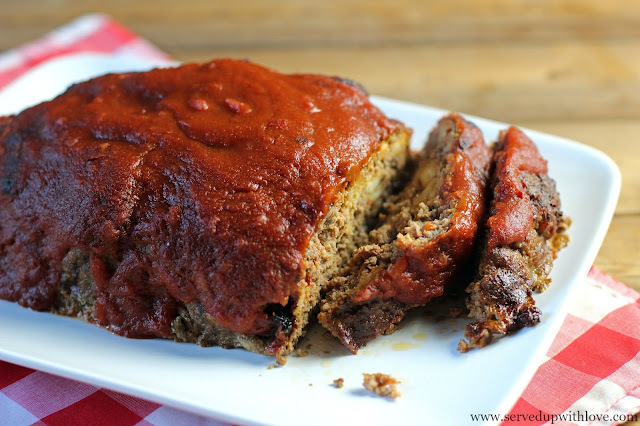 I used to make mine in the oven until one day I decided to try it in the slow cooker. 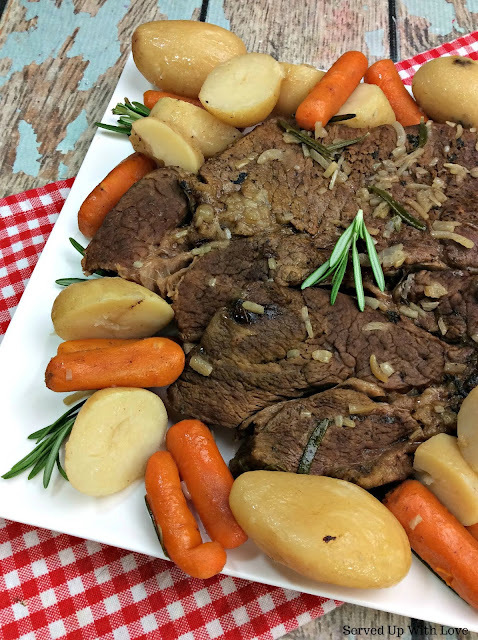 It took a few tries to get it right but I have finally found my go to recipe for roast beef and you can not get much simpler. I know mine can not compare to my Mom's but it comes really close. Total comfort food with very little effort. I love cooking in my slow cooker, just wish I used it more often. Makes my busy life a little less hectic at dinner time. Now lets get to the recipe. Peel the potatoes and cut them in big chunks﻿, half or quarter them depending on the size. Use the peeler and peel the carrots and cut them into chunks. Spray the slow cooker with cooking spray or use a slow cooker liner. I personally have not tried these but I hear great things about them. This makes clean up so much easier. 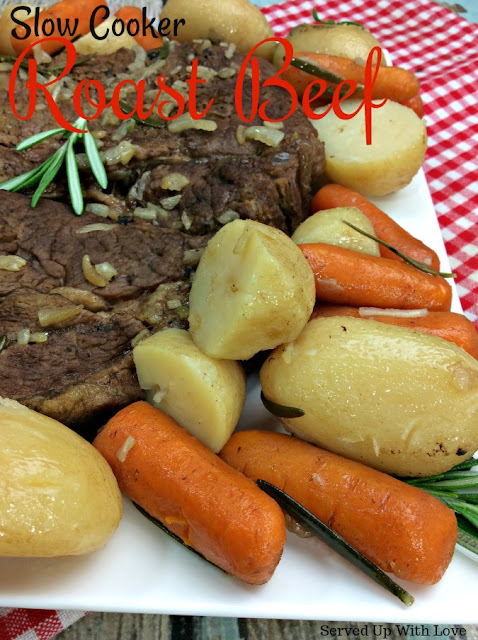 Place the roast into the slow cooker and place the veggies around and on top of the roast. Sprinkle the beefy onion soup mix over the roast and veggies. I usually add about a quarter cup of water into the slow cooker. Cook on low for 6 to 8 hours. Once this is done remove the roast and veggies and place on a plate or platter. If you would like to make gravy, pour the juice into a sauce pan and add a little water. Make a slurry with cornstarch and water and stir into the liquid and bring to a boil, this will thicken as it boils. 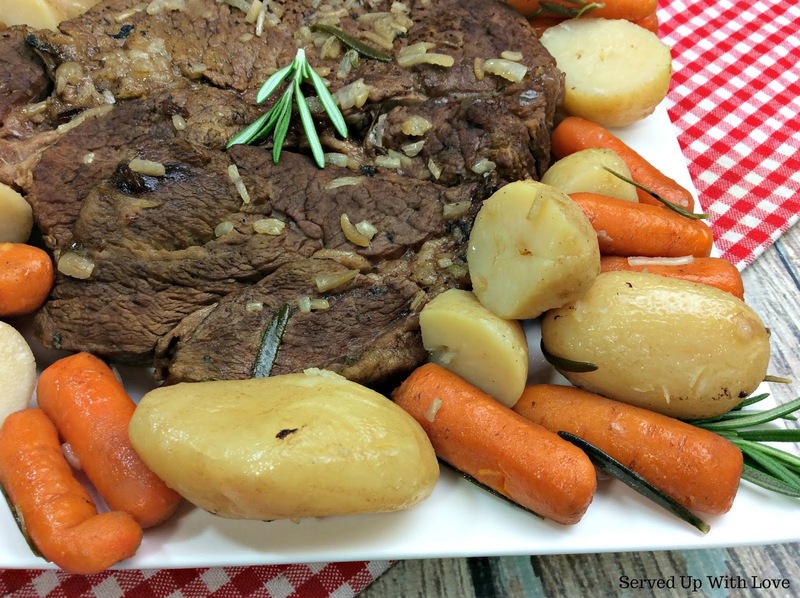 Place the roast into the slow cooker and place the carrots and potatoes on and around the roast, sprinkle beefy onion soup mix over and add the water. Cook on low for 6 to 8 hours.